It seems like everyone got to Brasserie La Gare before I did. Not only has it been critiqued by The Prague Post and Knedliky, Etc., but when I told colleagues I was going, two of them had already made several visits. But every experience is different, so I thought I'd add to the voluminous body of knowledge on this topic. Curly and I went and sat outside on a tolerably cool evening. The restaurant is non-smoking inside, but they do provide ashtrays outside. Edith Piaf sang in the background. 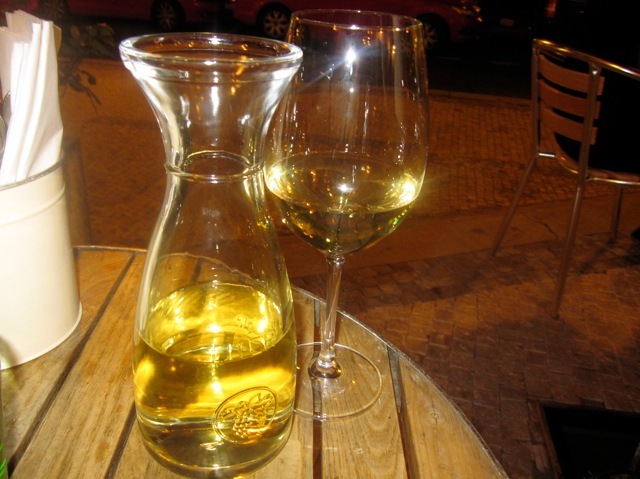 We commenced by ordering a half-liter of the house white, an Alsatian Edelzwicker (158 CZK). 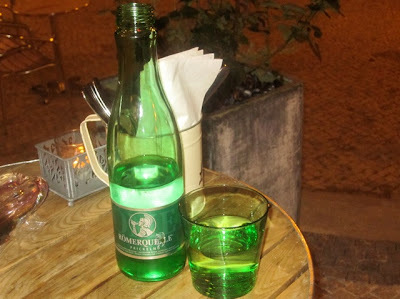 We were both happy with this crisp, simple, but refreshing wine. A big bottle of sparkling mineral water was Römerquelle from Austria (69 CZK). A bread basket arrived with several types of sliced baguettes, including a good cheesy one. On the side was salted butter. There is a 35 CZK cover charge per table. 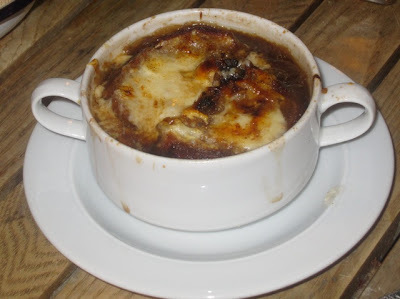 Curly didn't want a starter, and I wasn't terribly hungry, so I ordered the French onion soup (95 CZK). The bowl was quite small, but it all looked right -- the dark broth covered with toasted bread and melted cheese. First, let me warn you: it came out very hot and we both burnt our tongues. Second, let me warn you again, the soup was very sweet. In fact, Curly did not like it at all. One of my colleagues was also unhappy with it. He said it tasted like a bottle of wine was poured into the soup. Me? After the first initial sweet surprise, I grew to like it, but my tastes run sweeter than most. 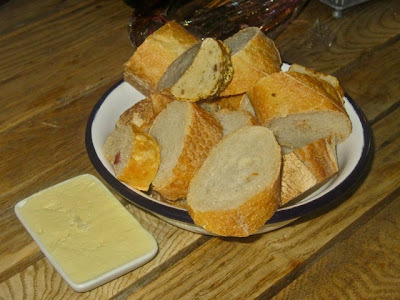 It was fully stocked with caramelized onions, and the salty bread and cheese helped offset the sugars. For a main course, I lobbied hard for Curly to choose the Coq au Vin (165 CZK). I'd heard good things about it. 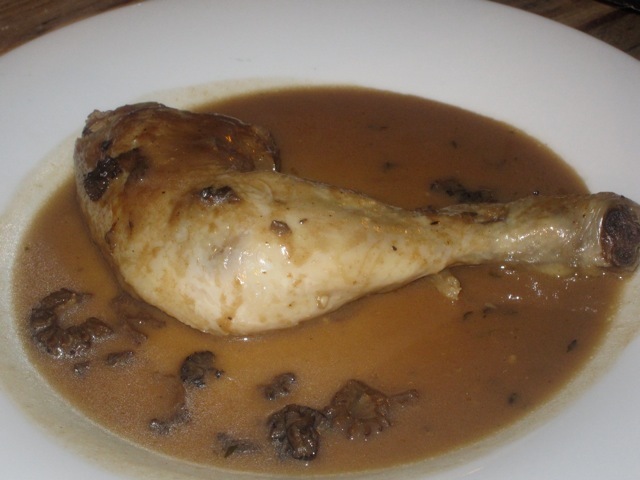 But she decided she wanted to Poulet de Bresse (195 CZK). The chicken was tender and competently cooked. But the morel sauce was a bore. It really didn't bring out the flavor of the mushroom. It tasted mostly of chicken and salt. Curly was disappointed, and wished she'd taken my advice. On the side, they offer a changing variety of three side dishes (85 CZK). On this night, it was super creamy mashed potatoes mixed with great, earthy mushrooms, pumpkin with goat cheese and parsley, and lightly cooked, crunchy Brussels sprouts with lardons. I loved all three of these. 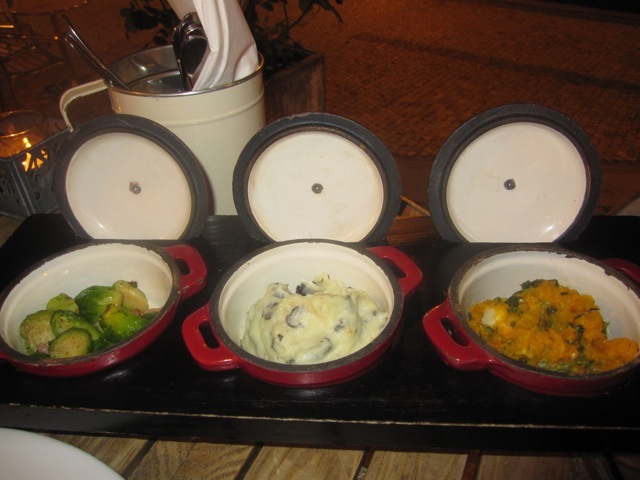 They're served in heavy little pots that help them retain their heat through the meal. I went for the Bavette de Boeuf or flank steak (195 CZK). 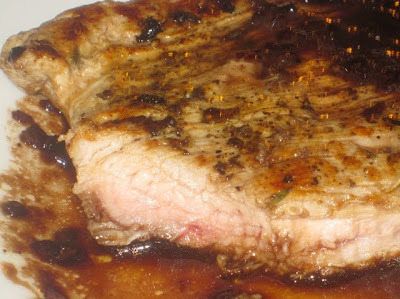 I like this cut, and it is also one of the cheaper steaks. The menu said it was sourced from France. I asked for it medium-rare, which is not easy to do for such a thin steak. They failed. It was beyond medium, with little if any pink meat to be seen. However, the light-colored beef was tasty and mostly tender. Some of the thinner sections were tougher, though. What really made it a winner for me was the shallot sauce. 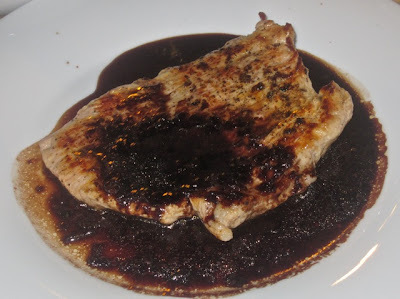 Made with liberal amounts of wine, the sauce was acidic, rather than sweet, and paired very well with the beef. I was soaking bread in it after the steak was gone. I ordered pommes frites on the side (65 CZK). 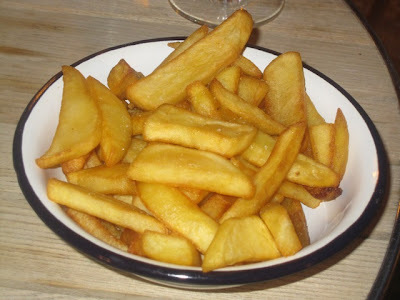 They were decent steak fries, but not too different from what you might find at many other restaurants. 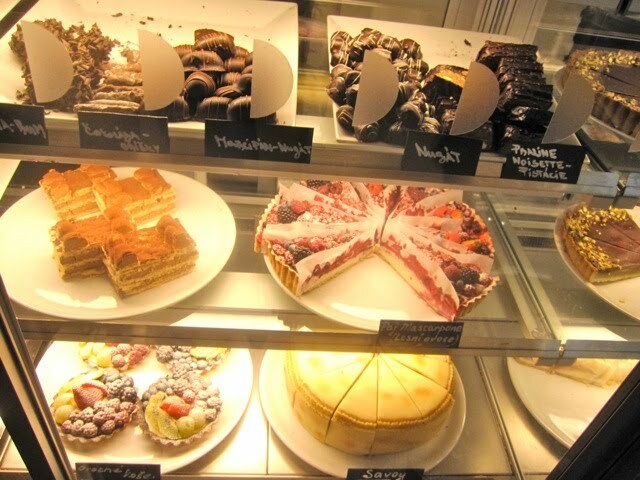 There is a large selection of desserts which come from a retail section of the restaurant, Boutiques Gourmandes. 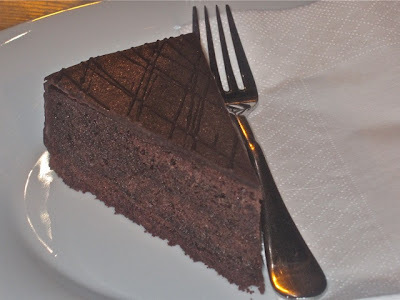 There were some tempting choices, but I predictably went with a chocolate standard, the Sacher Torte (69 CZK). The cake was ice cold, and when I put the fork into it, the hard chocolate on top popped up like a lid. Once I got the icing stabilized, it was quite good. The cake was very moist and had soaked up a great deal of the jam between the layers. The bill for this visit was 1001 CZK without tip. I went back the next day for an earlier dinner with Miss Knedlikova of Knedliky, Etc. fame. Some wrongly think of us as rivals, when in fact, I was a supporter from the beginning. There's a measure of self interest in that. 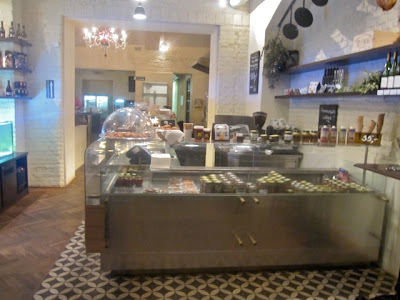 I have an insatiable hunger for info and photos about new and different places to eat. We also sat outside to enjoy the weather, so I took a quick look around inside. The dining rooms are light and airy, with white brick walls, red banquettes, and simple dark wood chairs and tables. It felt French. 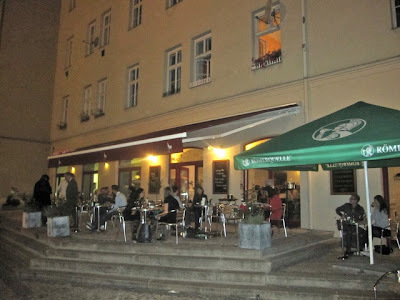 She had a glass or three of Chablis (89 CZK each), which she said was fine. 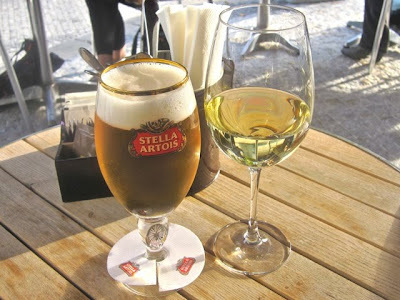 I had two .33 liter glasses of Stella Artois (35 CZK each). 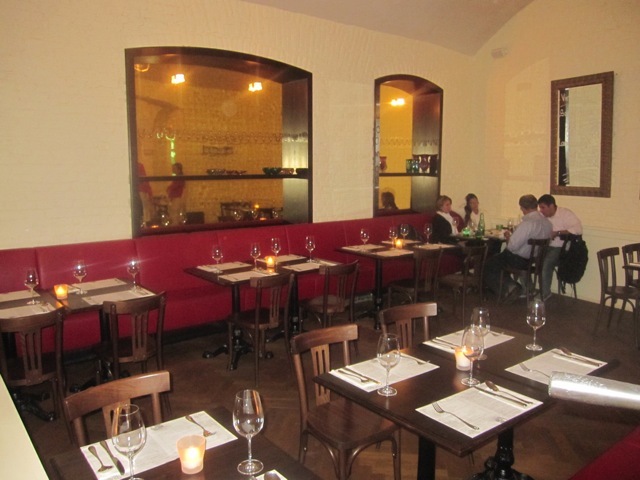 For a starter, we shared the Duck Foie Gras (195 CZK). 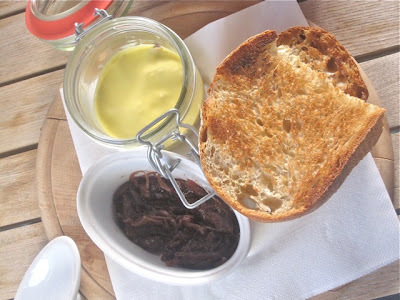 It is attractively presented in a glass jar with thick, crusty, toasted bread and an onion and fig compote on the side. After you dig down through a layer of fat, there's the cold liver. 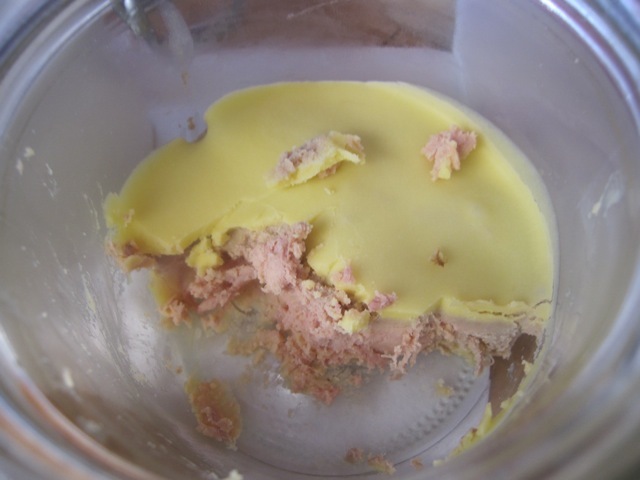 It's good, if a bit crumbly, but not as clean-tasting and silky as the foie gras at Na Kopci. The compote, also mixed with wine, was a great addition. We both liked it. For a main, I mentioned again that I heard the coq au vin was good. 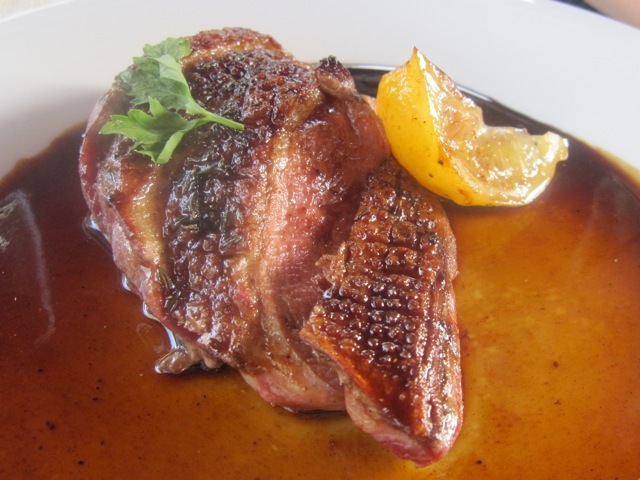 But Miss K loved what she had during her own review visit and ordered the duck with honey and four spices (195 CZK). She gave me a bite. I was not impressed. The sweet, tangy sauce was nice, but the duck was tough and took a long time to chew. Miss K agreed the duck was disappointing and said it had been much better the last time she had it. She also ordered the same three side items I had the previous night and enjoyed them very much. She was less of a fan of the Brussels sprouts and thought they should have been cooked more. But I liked them crisper. She also said that on her first visit, she had carrots and asparagus instead of pumpkin and Brussels sprouts. Even I didn't take my own coq au vin suggestion. 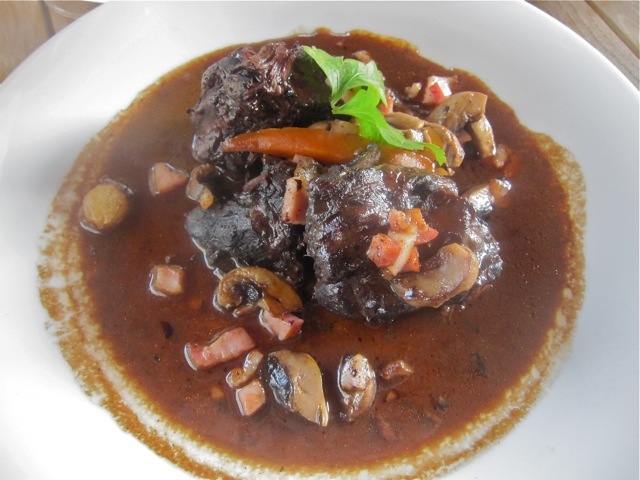 I was lusting after the Beef Bourguignon (165 CZK). The long-cooked meat was fork tender -- no knife required. The sauce, stocked with pork, mushrooms, carrots, pearl onions, wine, and beef drippings was delicious. The only problem I had was the temperature. It came out barely warm, and lost its remaining heat pretty quickly. Still, I liked it a lot. The bill for the second trip was 1012 CZK without tip. Service was just average and fairly indifferent, with some small delays. But there were no major breakdowns like The Prague Post reported. At the end, I took a look at their specialty shop. 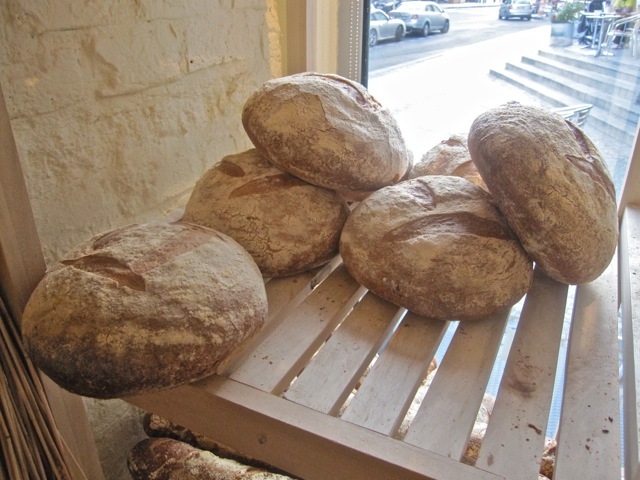 There were some beautiful fresh-baked loaves of bread. There was also a wonderful selection of cakes, tarts, and chocolates. They all looked terrific. You want my advice? 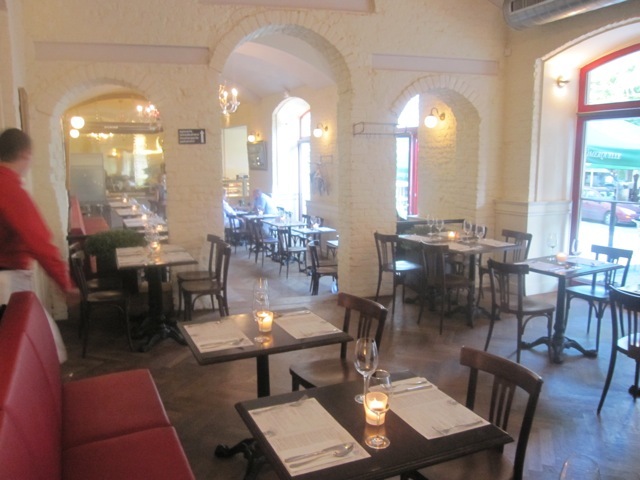 Give Brasserie La Gare a try. Based on my experience and the collective opinion of everyone I've spoken to, you won't like everything. But you may really like something, and there's good value. The prices are quite reasonable. 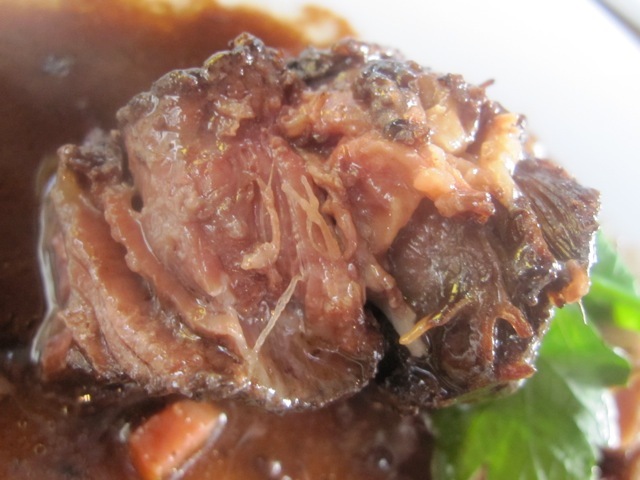 One last piece of advice: Try the coq au vin. I've heard it's good. Then tell me how it was. Thanks for reviewing! I want to try. I heard the brunch/breakfast was good. Please do a breakfast review! !